No, I didn't shut down the blog. After a much-needed break, I decided to change some things up here, which includes a brand spankin' new website. I didn't want to get rid of this blog completely because it holds SIX YEARS of precious memories. I also didn't want to migrate it all over though, because a new chapter in life deserves a new place to document it. This new blog is a bit more intuitive than this one— I gave it a much-needed facelift and I also am taking some other features (such as my newsletter) more seriously. 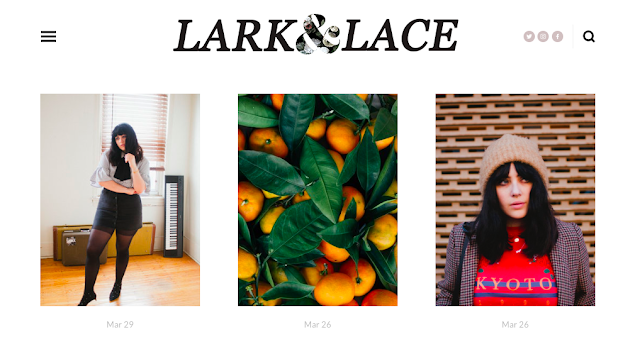 This blog went back to its original Blogspot address and the new one will be www.larkandlace.com from now on! What do you think? I'm excited! It's a bittersweet but much-needed change. I've been falling away from blogging a bit, something I know should come as no surprise to those of you who've followed for a while. I've been in a rut, uninspired, and, worst of all, stuck comparing myself to everyone else who seems to be killing the game. You know the kind of people I'm talking about. Endless wardrobe, seemingly constantly aesthetically-pleasing surroundings, doing nothing but floating from coffee shop to coffee shop creating great and engaging content. I don't know if I can keep up with it. I tried for a while and realized how disingenuous it all is. I look at some bloggers' feeds and think to myself, "damn! Who is financing this wildly aspirational lifestyle? Where are you storing these outfits full of pieces that never seen to repeat? Who the fu** needs that many handbags?" I took a few short breaks from social media because of it. I ended up feeling frustrated with the state of my hair, the shape of my body, and the fact that, more often than not, my ensembles are a little less than blogworthy. I love looks like this that I can get away with wearing over and over and over again. It's simple, timeless, and bold. Pleated mini skirt, white button-down, and vegan leather jacket? Three completely necessary wardrobe staples in my opinion. It's difficult to not feel like a Princeton professor in a herringbone blazer but I think there are worst things to dress up as so I'm just going to let it happen. This one is classic. I love its long silhouette and simple pattern. It's easy to dress up with its matching skirt or over a black dress but today, I opted to dress it down. Some raw-edge wide leg denim and cognac clogs were a perfect match.